2016 July | Federation of North-American Explorers | Semper Parati! God created all men for one purpose: to become saints. When the Jewish priests asked Our Lord which of the commandments was the greatest, He answered: “Thou shalt love the Lord thy God with all thy heart, and with all thy soul, and with all thy mind, and with all thy strength” (Mat. 22:37) and to “Love thy neighbor as thyself” (Mat. 22:39). These two commandments are a summary of the Ten Commandments. If every man were to obey these Commandments, they can become ordinary saints. 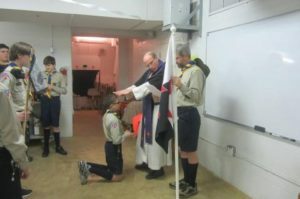 The Federation of North-American Explorers (FNE) is a Catholic scouting program in which each Explorer takes a promise to abide by those two Commandments. 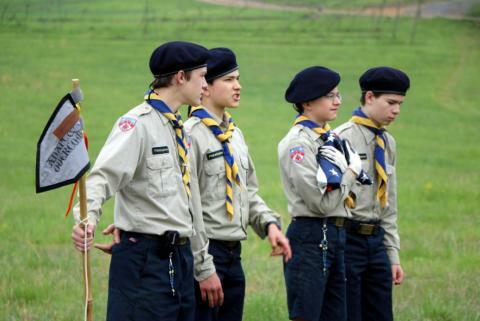 The FNE Explorer Promise states: “On my honor, and with God’s grace, I promise to do my best to serve God, the Church, my country, to help others at all times, and to obey the Explorer Law.” By keeping this Promise, one could certainly become an ordinary saint. When an Explorer takes his Promise, he pledges that he will try to become a saint and lead a holy life. The first step to leading a holy life and becoming a saint is to keep the promise “…to serve God [and] the Church….” To serve God means to have a relationship with Him. To have a relationship with Him, one needs to pray — or communicate with God — in order to find out how to serve Him best. 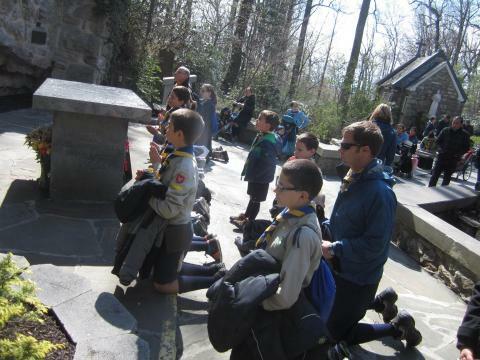 Prayer is an important part of all FNE meetings, field trips, and camps. Another way to create a special bond with God is through the reception of the Sacraments. The Sacraments allow a person to know God and to receive Him into his heart, and, by that personal meeting with Him, to love Him and serve Him. Opportunities to receive the Sacraments, especially the Holy Eucharist and Reconciliation, are offered every day at camps. 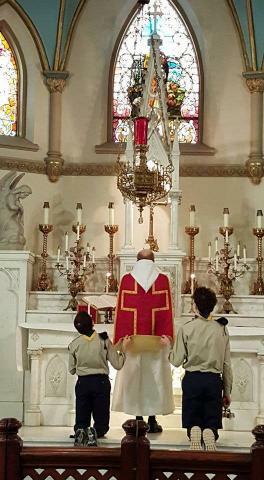 FNE Pilgrimages and retreats also help discern one’s vocation. Thus, to serve God and His Church through prayer and the Sacraments is one important way to reach Heaven. The next segment of the Explorer Promise is — if properly followed — another reason why living this oath is a way to holiness. This section is: “…[to serve] my country [and] to help others at all times….” If one is loyal to his country within the spiritual teachings of the Catholic Church, he is loyal to God. Patriotism is a moral virtue. Men must embrace God’s virtues and follow his paths to get to Heaven. Patriotism disposes men to have respect and love for their country, and to be active contributors to their communities. 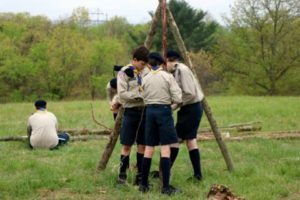 In the FNE, Explorers are taught about their country and its history, and how to respect and appreciate the freedoms earned by patriots. This section in the Promise also includes helping others. FNE Explorers help those in need by performing service projects, such as free dinners for the homeless, park or church clean-ups, visits to nursing homes, pro-life work, and many other tasks. Each Explorer also takes on a specific duty to help his group. Also, another important piece of being an Explorer is the daily good turn. This is a way to serve others every day through small acts of kindness. Serving country, community, group, and neighbor are important parts of living the Explorer Promise. The last piece of the FNE Explorer Promise is the final evidence that a way to reach heaven is in this pledge. The part is this: “…to obey the Explorer Law.” The Explorer Law is a set of ten important statements that, if faithfully followed, can lead a soul to Heaven. The first Law requires Explorers to be honest. The importance of this is that it follows the Eighth Commandment, or one of God’s steps to reach Paradise. Laws two to five call Explorers to practice the virtues of patriotism, filial piety, charity, fraternity, and chivalry, which are all related to serving others. Law six obliges Explorers to love God by respecting all of His creations, especially while enjoying life in the outdoors. Another excellent point in the Law to follow is Law seven, which compels the Explorer to “…obey proper orders without question, and leave nothing half-finished.” It is vital for one to be obedient to his lawful superiors to reach Heaven. This Law goes hand-in-hand with Law eight, which encourages the Explorer to remain gleeful and happy as he works, even when doing difficult tasks. God, in His Divine Providence, wants all men to remain joyful as they work, and even as they endure hardships in life. Law nine, another step towards Heaven, commands an Explorer to be thrifty with not only his possessions, but also those of others. Lastly, there is Law ten, which encourages the virtues of purity and cleanliness “…in thought, word, and deed.” All ten of these Laws create the model that a person can follow to become an ordinary saint. Therefore, when an Explorer serves God and His Church, when he serves his country and his neighbor, and when he follows the goals set in the Explorer Law, he will be following Christ’s Greatest Commandments, and he will make it to Paradise. An Explorer loves God and the Church through prayer and the reception of the sacraments in meetings and camps. He becomes patriotic and charitable as he learns about his country and how to help his neighbor, putting others first and himself last. An Explorer practices the virtues included in the Explorer Law in his life at home, in school, at camp, at work, and at play. However, the most important part is found at the beginning of his Promise, when the Explorer says: “On my honor, and with God’s grace, I promise to do my best….” By this he means that an Explorer can do anything if he puts forth his best effort and trusts that God will give him supernatural graces. If he succeeds, the Explorer will be found trustworthy, so people will see that he cares not just about his own good, but that of others. Through our honor and our obedience of God’s Commandments we can reach Paradise. Anyone can walk the path to Heaven and become ordinary saints by living the FNE Explorer Promise!